What Minnesotan doesn’t look forward to flowing rivers of melting snow in the spring? Chances are most of us do – - even the winter fanatics should have had their fill of winter activities come March 20, the first official day of spring. 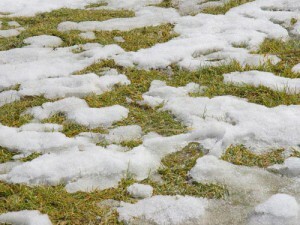 This year’s spring, however, will bring some trepidation for homeowners as they begin to uncover their lawn after winter snow has finally melted away. And rightfully so. We at GH are concerned too. To inform our services and advise our clients, we follow government, national and local groups that regularly provide surveys, stats, trends and predictions and monitor drought, climate changes and storm assessments. We track this data ourselves and apply it to our business for predictive modeling of services needed per each season and tailor our services offered accordingly. We not only share these service offerings with our clients, but we also aim to raise awareness of the effects of climate and educate our clients on steps they can take to assure they have a solid lawn-care plan for each season. Services we track include the U.S. Drought Monitor, the National Weather Service’s Climate Prediction Center (CPC) and the University of Minnesota Department of Horticulture Science. On February 14, 2013, The U.S. Drought Monitor, released a study that places large portions of northwest, west central, southwest, and south central Minnesota in the Extreme Drought category. Minneapolis falls into the Severe category (see map) while southwestern falls into the Extreme category. This site gives us historical context and a national picture of what’s going on climate-wise with weekly updates. Of recent positive note is CPC’s movement for Minnesota into the Improvement category in their February 7-April 30, 2013, Drought Prediction Survey, based on two large snow events with high water content, occurring over the last three weeks (mid Jan – early Feb), See http://www.cpc.ncep.noaa.gov/products/expert_assessment/seasonal_drought.html. We like that CPC’s predictions factor in the effects of recent precipitation and we can reference it biweekly for updates. Lastly, we look to the U of M and their wealth of data on climate and horticulture. They state that Minnesota’s interesting climate — which in a single year can produce temperatures ranging from -50 to 100° F — offers researchers and students a special opportunity to study plant life in extreme conditions.The site is a good resource for navigating lawn care in Minnesota. We like their optimistic attitude even if their statement about extreme temperature ranges keeps us on edge. Visit their site here. GH’s assessment of all of this data, shapes our message to our clients this March: homeowners should be concerned about their lawns and take some additional steps this spring. Find out more about mulching, lawn repair and Spring Clean-Up Services.